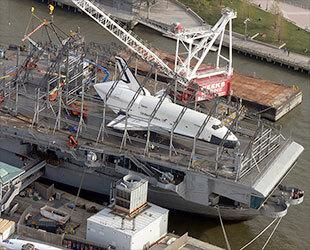 – Space shuttle Enterprise is ready for its re-debut. NASA's first winged orbiter, a prototype spacecraft used in the late 1970s for atmospheric flight and ground tests, the shuttle Enterprise will reopen on display Wednesday (July 10) at the Intrepid Sea, Air & Space Museum in New York City. The space shuttle, which has been off-limits to the public for the past eight months, first debuted on exhibit on the flight deck of the Intrepid museum, a converted World War II aircraft carrier, last July. Three months later, Hurricane Sandy hit Manhattan, leaving the space shuttle with minor damage but destroying its air-pressurized enclosure. 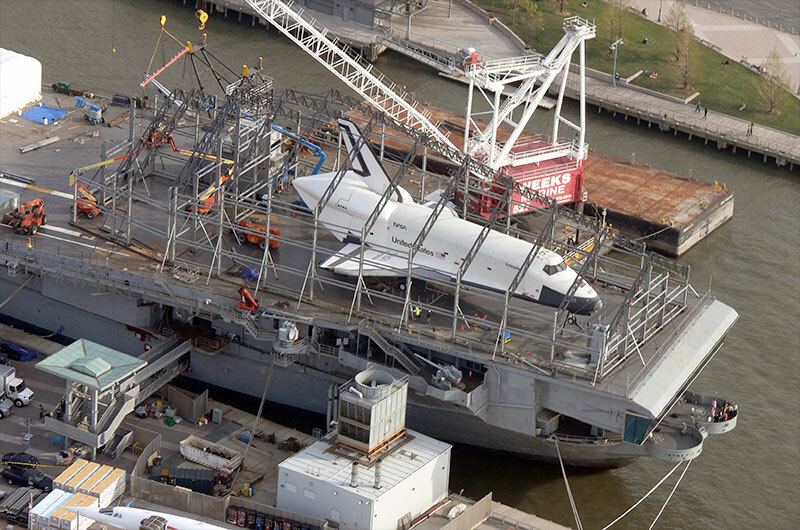 The Intrepid's new "Space Shuttle Pavilion," which relies on a metal skeleton to maintain its shape, is now ready to again open to visitors. 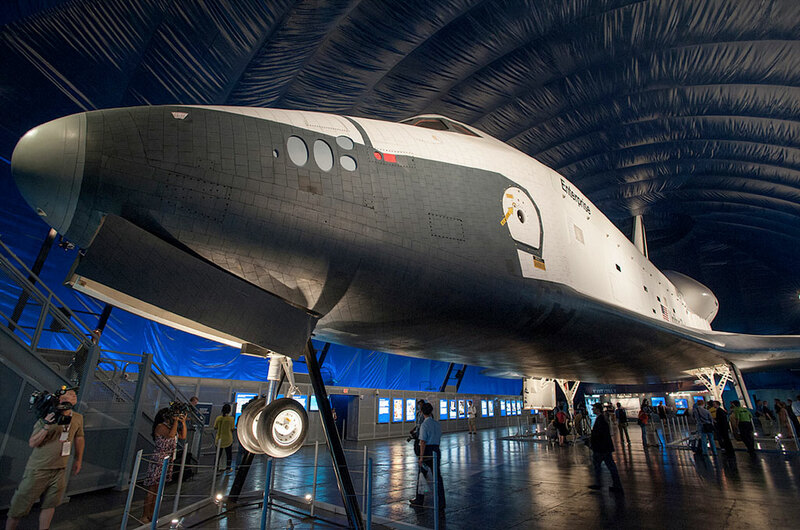 "After many months of hard work recovering from Sandy we are extremely excited to announce the opening of our new Space Shuttle Pavilion, and to once again [be able to] share Enterprise with all who visit the museum," Intrepid president Susan Marenoff-Zausner said in a statement. The new structure is more than just a redesigned shell to cover the same exhibit. Enterprise, which as before is mounted 10 feet (3 meters) off the deck, allowing guests to walk underneath it, is now joined inside the pavilion by another spacecraft. 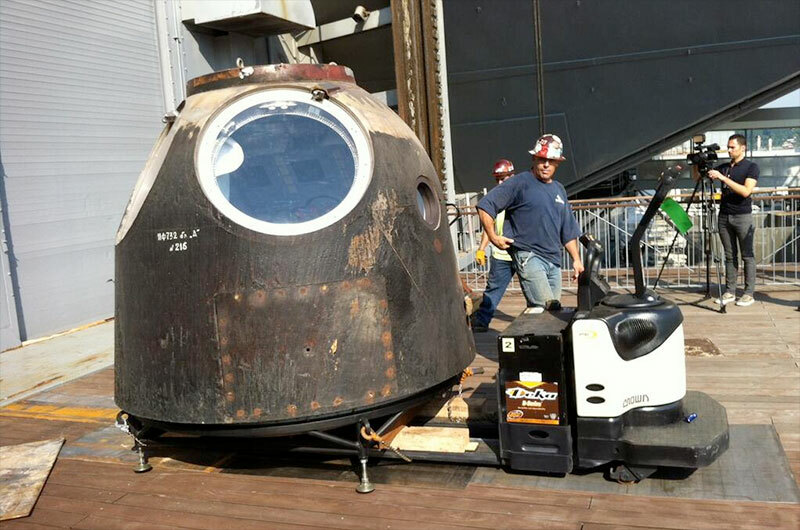 The Intrepid moved its Russian Soyuz TMA-6 spacecraft exhibit from the aircraft carrier's hangar deck to the flight deck pavilion on June 25. The capsule, which flew to and from the International Space Station (ISS) in 2005, is on loan from Gregory Olsen, who landed aboard the Soyuz as a privately-funded flight participant, or "space tourist." Since retiring the space shuttle fleet in 2011, NASA has relied on Russia's Soyuz to fly its astronauts to the space station. The U.S. space agency is intending to hire private launch providers to resume domestic flights to the orbiting outpost as the commercially-built and operated spacecraft become available in 2017. 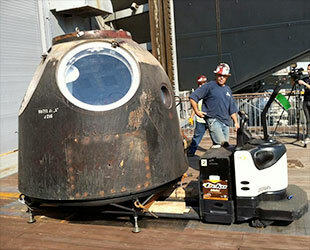 The Intrepid's flown Soyuz is one of only three on display in the United States. In addition to the capsule, the rebuilt pavilion also features a new stage for programmed demonstrations, new exhibits highlighting technology spin-offs from the 30-year shuttle program, and a film narrated by "Star Trek" actor Leonard Nimoy about the history of the winged spacecraft. Enterprise, however, remains the centerpiece. The exhibit includes a larger observation platform, atop which guests can get nose-to-nose with the prototype orbiter. And a new soundscape entryway greets visitors coming to see the space shuttle with the audio that was recorded between NASA's mission control and the astronaut crews who flew Enterprise's approach and landing tests. 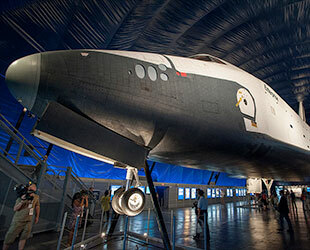 "Our team is working hard to bring an incredible exhibit to life that will allow space shuttle Enterprise to continue to inspire generations of innovators and dreamers for years to come," said Marenoff-Zausner. The reopening on Wednesday marks just the beginning of the Intrepid's planned festivities to welcome visitors to the new display. As it did last year for the first ribbon cutting, the museum is again organizing a "SpaceFest" celebrating "all things space." For four days starting July 25, the Intrepid and its partners will host hands-on demonstrations, astronaut appearances and free movie screenings. Among the other SpaceFest highlights, the museum will unveil a LEGO model of space shuttle Enterprise assembled by a LEGO master builder. The rebuilt Space Shuttle Pavilion is a temporary home for the real shuttle, which was added to the National Register of Historic Places in March. The Intrepid is working toward building a permanent exhibit facility for Enterprise, which will display the orbiter near, but not on, the aircraft carrier, while providing enhanced educational programs.